Eighteen years ago, there were no magic supply stores on the internet. In 2001, Ellusionist hit the scene and changed it forever. Today, the Ellusionist store sells magic DVDs, supplies, and playing cards. Visitors can buy everything they need to learn and perform dozens of tricks, as well as downloadable videos that let magic enthusiasts learn from the best. Card deck storage, artwork, table pads, headphones, and a wide variety of other accessories—many of them manufactured by Ellusionist—round out the online store. And Ellusionist has seen massive success. The company spawned an entire custom playing card industry. They host the largest magic-related forums on the internet, with over 60,000 members. Their social following is immense, with 95,000 followers on Instagram and over 245,000 on Facebook. And their secret menu, which insiders frequents, has a following of its own. It’s not just their selection of products that generates such dedicated fans. Ellusionist has assembled a team of fantastic, charismatic magicians that have phenomenal screen presence. With urban flair and practiced storytelling skills, they’ve helped Ellusionist build a reputation for teaching some of the most stylish tricks around. In short, Ellusionist is a dominant force when it comes to magic tricks and supplies online. And video has helped them get there. “Video has been an incredibly important sales and marketing tool from the beginning,” says David Mitchell, technical director for the site. So much so that they already had over 300 videos when they started looking for a new way to distribute their content to customers. After an exhaustive search of video subscription providers, Mitchell and his team decided on Uscreen. They spent time exploring a free trial account, and were amazed by the platform’s simplicity and ease of use. Ellusionist set up their streaming site, known as MagicStream, and within a year had thousands of subscribers. Today, MagicStream’s members watch over 130 days’ worth of video every month. And the company continues to add content from their catalog and develop new videos exclusively for MagicStream. They offer hundreds of videos, including entries from a wide array of magicians on topics like sleight of hand, card magic, street magic, organic magic, coin tricks, mentalism, and more. The site just keeps growing. Since launching their video channel, MagicStream has seen higher-than-expected subscriptions, sales, and traffic to their webstore. And Ellusionist doesn’t intend to stop. They’re planning on releasing a branded app, expanding their partnerships with magicians, and continuing to offer popular content through a voting system. 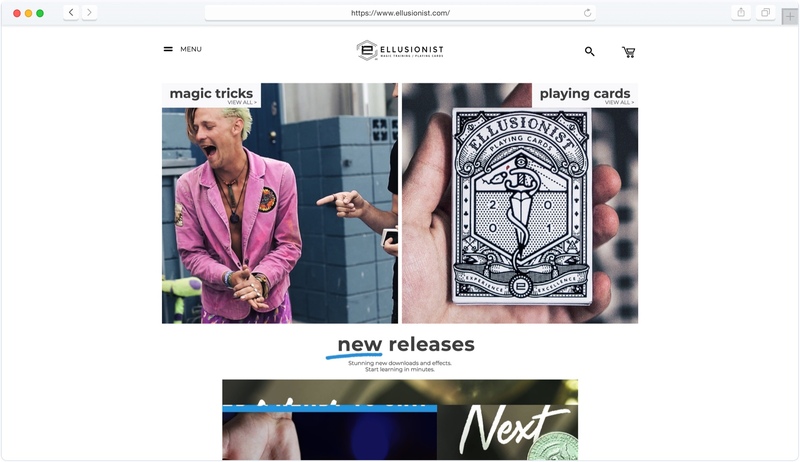 MagicStream helped Ellusionist bring their one-of-a-kind content to a wider audience for just $12.99 per month. With hundreds of videos, thousands of subscribers, and endless possibilities for expansion, Ellusionist is leading the way in the online magic scene. Many have tried to imitate its success, but hundreds of thousands of fans and customers—along with some of the most professional and high-quality video content out there—keeps Ellusionist on top.